Home › Books › Oh happy days: I’ve got a British Library Reader Pass! 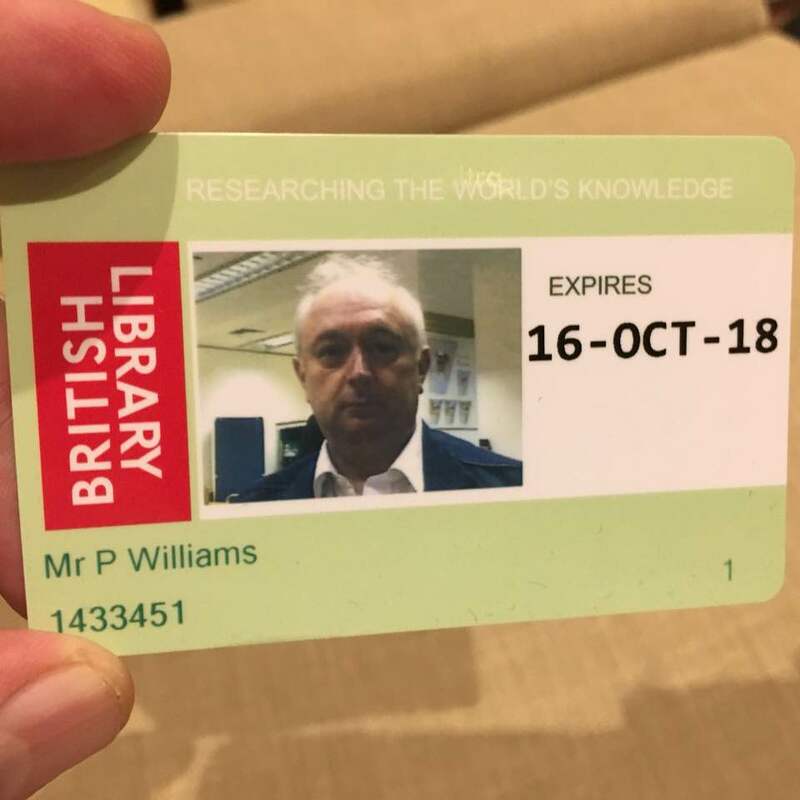 Oh happy days: I’ve got a British Library Reader Pass! 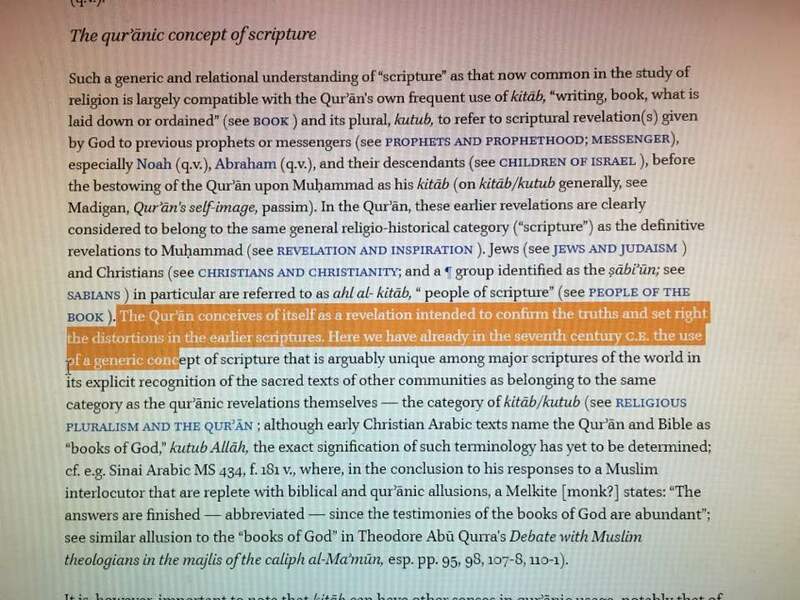 I wanted to do some research on how top Western scholarship understands what the Qur’an teaches about the scriptures of the People of the Book (the Jews and Christians). This question is a storm centre for Christian-Muslim polemics. Evangelical apologists are adamant that the Qur’an does not teach that the original Revelations given to Moses (Torah) and Jesus (Gospel) have been corrupted or lost. Muslims insist however that the original Books have been corrupted to a greater or lesser extent. So I was very curious to find out what the best Western experts on the Qur’an conclude. I assumed that they would be relatively free from bias as it is difficult to see what ideological interest they might have one way or another on this question. The Encyclopaedia of the Qurʾan (edited by Jane Dammen McAuliffe) is an academic encyclopedia with articles on the most important themes and subjects of the Qur’an. It is considered to be the standard academic reference work on the subject. I tried to view a copy at King’s College in London but they turned me away and sent me off to the British Library. This evening I visited the Library and after a short interview they gave me a Reader’s Pass :)) with unlimited access to their books for a year. The British Library is a major research library with around 14 million books along with substantial holdings of manuscripts and historical items dating back as far as 2000 BC. The Library receives a copy of every publication produced in the UK and Ireland (approximately 8,000 per day) adding some three million items every year occupying 9.6 kilometres (6.0 miles) of new shelf space. 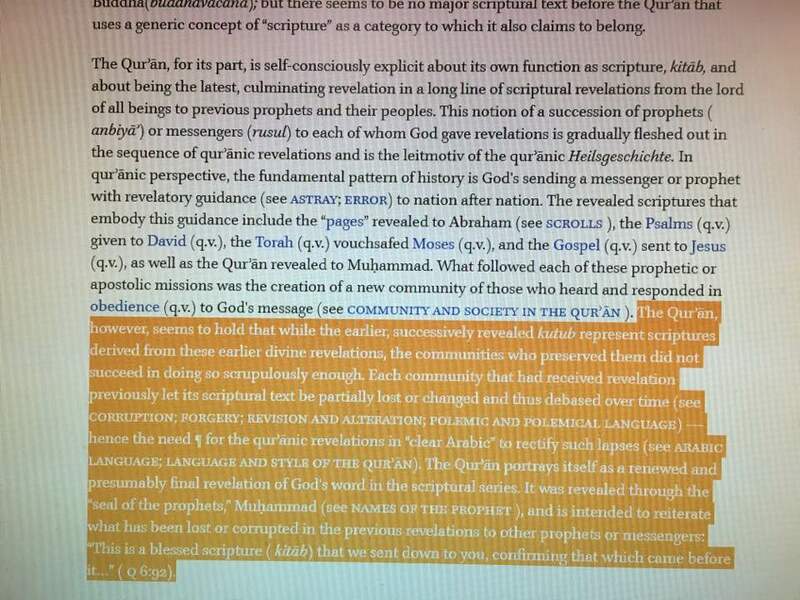 I took these two pics of articles in The Encyclopaedia of the Qurʾan. The scholars basically agree with the traditional Islamic view that the Qur’an holds that previous scriptures have been ‘corrupted’ or lost. Hence the need for the Qur’an to rectify these lapses. i think it is scholarly consensus that the quran thinks the previous scriptures have been textually corrupt. one does not need to be a scholar to see that the bible is a corrupt book, just juxtapose its stories. Bassam Zawadi goes in to depths and gives many arguments that proves that Islam confirms the previous scriptures have been lost. After all, there’s a reason why Quran has been described as arbitrator. Your mission is to read a third of all the material by the New Year.